God is true. The universe is a dream. Blessed am I that I know this moment that I have been and shall be free all eternity; ... that I know that I am worshiping only myself; that no nature, no delusion, had any hold on me. Vanish nature from me, vanish these gods; vanish worship; ... vanish superstitions, for I know myself. I am the Infinite. All these - Mrs. So-and-so, Mr. So-and-so, responsibility, happiness, misery - have vanished. 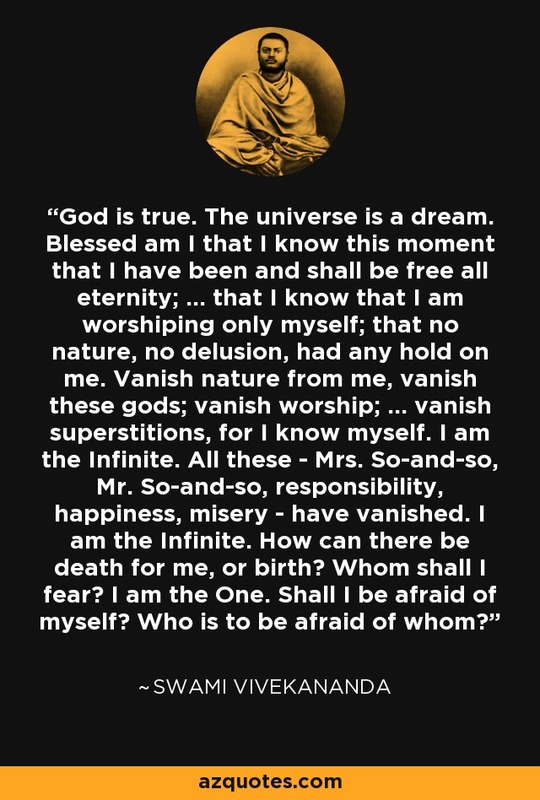 I am the Infinite. How can there be death for me, or birth? Whom shall I fear? I am the One. Shall I be afraid of myself? Who is to be afraid of whom?